The word "chikungunya" is thought to derive from description in local dialect of the contorted posture of patients afflicted with the severe joint pain associated with this disease. Because CHIK fever epidemics are sustained by human-mosquito-human transmission, the epidemic cycle is similar to those of dengue and urban yellow fever. Large outbreaks of CHIK fever have been reported recently in Sri Lanka. In December 2006, CHIK fever cases also have been reported in capital city Colombo transmitted from India. During 2006, more than kilo cases of CHIK fever virus were diagnosed virologically. Clinicians should be alert for additional cases among fever patients, and public health officials should be alert to evidence of local transmission of chikungunya virus (CHIKV), introduced through infection of local mosquitoes by a person with viremia. Aedes aegypti and Aedes albopictus (the Asian tiger mosquito) are the primary CHIKV vector in Sri Lanka. In Asia, CHIKV epidemics involve a human-mosquito cycle, with humans serving as the sole vertebrate amplifying hosts. Most CHIKV epidemics occur during the tropical rainy season and abate during the dry season. Human CHIKV infections include a transient, high-titered viremia (typically detectable during the first 2 days of illness, ranging up to 6 days after illness onset) that is adequate to infect feeding mosquitoes. Ae. aegypti and Ae. albopictus are abundant peridomestic species and aggressive daytime blood-feeders in all tropical and most subtropical areas of the world, and Ae. albopictus now lives in many part of Sri Lanka. Early recognition of local transmission followed by prompt, aggressive vector control and other public health measures might prevent long-term establishment of the virus in new areas. Most CHIKV infections are symptomatic. In clinical infections, the incubation period typically is 2-4 days. Illness is characterized by sudden onset of fever, headache, malaise, arthralgias or arthritis, myalgias, and low back pain. Skin rash occurs in approximately half of cases. Joint symptoms can be severe and involve small and large joints. Although CHIK fever typically lasts 3-7 days and full recovery is the usual outcome, certain patients experience persistent joint symptoms for weeks or months and occasionally years after illness onset. Serious complications (e.g., neuroinvasive disease) are rare, and fatal cases have been documented conclusively (very rare). Transplacental CHIKV transmission and severe congenital CHIKV disease have been described. CHIKV infection is believed to confer life-long immunity. Because no specific drug therapy is available, treatment of CHIK fever is supportive. No licensed CHIKV vaccine exists. Therefore, prevention recommendations for people who live in outbreak areas in Sri Lanka should emphasize mosquito repellent and avoidance measures. In early illness, the clinical features of CHIK fever can be similar to those of dengue and malaria, especially in patients without joint symptoms. In both dengue and CHIK fever, rash usually is generalised and maculopapular, but petechial rashes occur in certain dengue cases. Additional imported but unrecognised cases likely occurred in this nation. Clinicians should be aware of possible CHIKV infection in travelers returning from CHIK-fever endemic or outbreak areas, particularly if an acute febrile illness with arthralgias or arthritis occurs. Suspected cases should be reported promptly to local and state public health officials and to MOH. 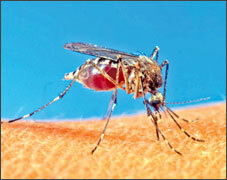 Mosquito exposure should be strictly avoided during the first week of illness to prevent infection of local mosquitoes. In Sri Lanka, diagnostic tests for CHIKV infection are available at Gentech, MRI, and Ragama Medical Faculty. Laboratory diagnosis depends on antibody-capture IgM ELISA, and plaque-reduction neutralisation tests of serum. Virus isolation attempts and PCR assays are performed selectively.